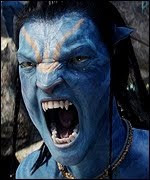 $2.7billion just isn’t enough for some people, more specifically 20th Century Fox and James Cameron, as it has recently been announced that Avatar will be re-released at the end of this Summer. "Audiences repeatedly told me they wanted more of Pandora, and wished they could have stayed there longer. So we're making that possible," Cameron said in a statement. "Avatar: Special Edition will be exclusively in 3D, and will have eight minutes of never before seen footage, including new creatures and action scenes." 20th Century Fox are obviously going to milk the Avatar franchise for all it’s worth. Not content with just releasing a bare-bones Blu-ray earlier in the year, this theatrical release will precede the expected double-dip Special Edition Blu-ray due in time for the Christmas holidays. Talk about saturating the market place. There aren’t many films that will have seen two theatrical and two home-entertainment releases all within the same year. Is this too much? Or are they giving the consumer what they want? We’ll find out when Avatar: Special Edition is released 27th August 2010 in the UK and US. Full release schedule can be found at the official site here.